You mean is good idea to do both??? It is a good idea to do both kiyoki. The easiest way to prepare the herb and fluids is to steep them into tea and then sprinkle the water at the entrance to his apartment, where he will walk in it. Also add some of the water to the washing machine when you wash his clothes; this will ''fix" his laundry. Didn't think about it , washing his cloths with catnip water. So I have to steep them in boiling water?? to make tea? Yes brew a strong tea with it and use that in the bath. You can bath in the water then use that water to do as mentioned above then it has you on it, your intention and the catnip. Best of luck! Hoodoo Spiritual Baths is a clear, concise, and authentic guide to traditional techniques of bathing and cleansing. 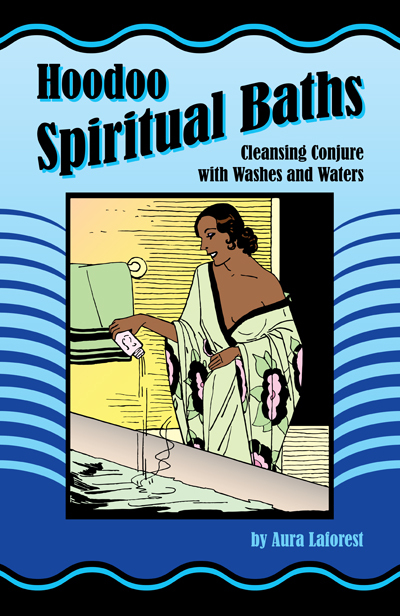 Learn how to perform a spiritual house cleaning, how to take a magical bath, and how to ritually dispose of bath waters. 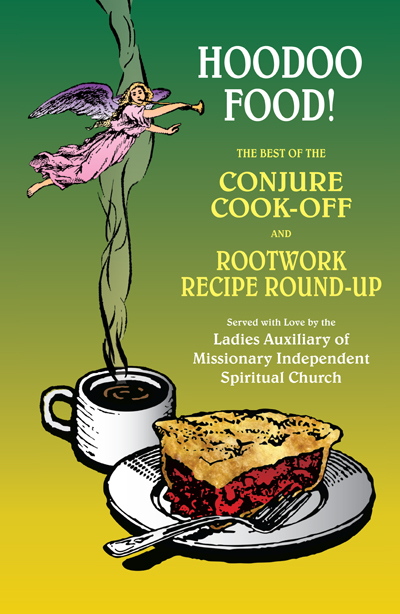 This practical guide contains clear instructions on how to use easy-to-find ingredients for teas, baths, and washes, plus dozens of time-tested spells and recipes for every condition, including uncrossing, protection, love, sexuality, marriage, beauty, money drawing, business, gambling luck, blessing, and success. Hi Can i give Catnip tea my boyfriend to drink? Then how many tea spoon should I use? Is it safe to drink? You can safely drink catnip, but it is a mild sedative so he'll likely feel quite relaxed. A beverage tea would be made by steeping 1 teaspoon of the herb in a cup of water. Add a drop of your menstrual blood along with the herb to get the most potent magical effect. I did it (menstrual blood) with coffee. My new situation Is now, He is going to counseling to see it work or not. getting ready for freezer spell got my exs lady's picture today. Do I have to add my menstrual blood all the time or once enough? I personally like to do it s frequently as possible. When I was married, I did it all the time! I just have a question - is Catnip by itself effective enough for attraction work? I know some people advice using it with other herbs, but I just want answers to my question. Yes, it's effective. But, in Hoodoo, we like to use more than one herb. But, remember, it only has limited properties. So, that's a reason that we use other herbs: to cover all our bases. I was just on the list of herbs page shopping for more supplies when I came across the herb Couch Grass (bear with me...this IS about Catnip, I promise). On the herb label it says if you want to break up two people, you should take two figural candles, carve names, dress with Hot Foot, sprinkle Dog Grass/Couch Grass on one candle and Catnip on the other. Then burn and move farther apart for seven days. Why Catnip???? Catnip is used to captivate your lover and capture his heart, so if you're trying to separate them and move them away from each other, why use something that will continue to captivate his heart in that relationship? I've used Catnip in this type of work to draw an outside lover to the other person. That way they are interested in someone new and are more inclined to break up. Other people may use it differently. That's just one of the many wonderful ways Catnip can be applied. The catnip bath is very powerful and takes instant effect, I tried it out last night. thanks for sharing this with us! I wanted to know if I can add catnip as a herb in your love oils. 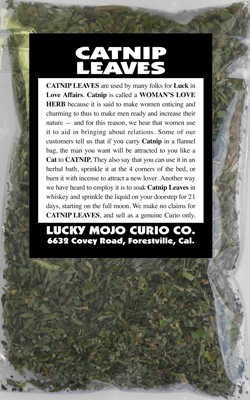 Yes, you can add Catnip to our love oils. A few already have Catnip in them, by the way, but adding more will not hurt. Question: I am a man who just set a honey jar spell to draw a specific woman to me. Along with personal concerns, I included two rose petals, cinnamon and catnip. would appreciate any information, thanks very much. About 50% of cats really get into Catnip and perhaps one-third of cats do not respond to it at all. Of those cats who like it, more are male than female, with neutered males falling somewhere in between the two sexes. Therefore, some people prefer to use Catnip to magically attract men, as a statistically more probable outcome, using cats as an analogue species. It takes a real stretch however, to decide that Catnip should "only" be used for magically attracting men and "never" for magically attracting women. That makes no real sense, because, after all, many female cats ARE attracted to Catnip. Thank you so much for your answer, Miss Cat. You have provided some fascinating enlightenment about the unique nature of catnip, and have given me much valuable insight to meditate upon as I continue to work my jar. Hi, today my boyfriend and I went couple counselling. first he didn't want go but i request come as a favor I would like to learn. Before I go I took boiled catnip bath didn't dry and put on my cloths and went. After the counselling session we walk back on the way he hold me and squeeze my bum and hold my hand and walk took me out for supper. we didn't had good bye hug or kiss. I asked him do you want to go counselling again? as counselor told us talk and decide. He asked me what you want. I asked what do you want? He is the one who want to break up with me. I said I want to think then he said the same. So cat nip water worked some kind of way. But still he is not really clear to get back with me. I don't want force him or beg him. I have that bath water. what should I do with them? As I can't go to his place. Any other way to use them. I am planing, when I go see him again I will have catnip bath. Well, that is GOOD news. You would do with the bath water the same as any other Spiritual bath water (and I do remember us talking about a different bath water on a different subforum). Would have been really nice if LM has catnip oil, that way it can be mixed in body lotion ....just thinking out loud. 1) Catnip bath water to sprinkle my ex"s apartment entrance, Can I add my menstrual blood to the water before I sprinkle at the entrance? 2) Mixing catnip with whisky and sprinkle, At my door step or his (Ex's) door step? 1. yes you can , pour it at the door step, wipe the door and knob if you can. 2. Your doorstep, I think you are referring to the spell where you add the catnip to whisky and pour on door step for 21 days and light a total of 3 red 7 knob candles one knob each day= 21. This would be sprinkled to draw the person to your door. Some people do take baths and sprinkle the water from the targets door step to their to symbolize the person coming to them as well. I can go in. But it is a risk. That building has a camera. But i can sprinkle at the main entrance while i walking by. I can go in, But I have to be very careful. I will try. Yes, catnip/whisky spell. I didn't know i have to light 7 knob candles. Can i use regular candles for now. Tomorrow is full moon. I want to it start tomorrow. I want sprinkle catnip bath water at his door step. How often should I sprinkle bath water at his door step? I apologize I did not mean to confuse you! You do not need to do the red candle with it, this is how I was taught to work them together, however yes you can use the catnip and whisky as its own working. But I do think they go well together, two separate workings that support each other and mesh well together one is a candle spell to draw the lover, the other is the sprinkle to draw them to your door. If you do not have a seven knob candle, you can use tea lights, dress them with the love oil you are using pray over them and sprinkle a light bit of cat nip on it ( no whisky please no fires lol). Use them for 21 days. It's better to do the job safe and not get in trouble so try your best. Maybe get as close as possible to the apartment, like if their is a hall leading to it sprinkle their where he will walk. You can do it as often as you want. Bath in catnip soak in it, then save some of the water and sprinkle at his door to your door. A great day is friday for love, and during the waxing moon. Please do not think of folk magic spells as game rule sets, think of them more as improvisatory dance. Magic is an art, not a lab science. 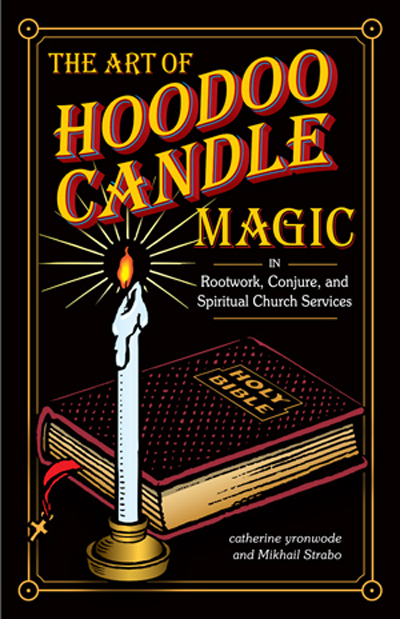 If you have a seven knob candle, use it as you were told, for that is an emulation of the way one well-learned practitioner did the work. If you do not have a seven knob candle, you may use a series of tea lights, as j82 suggested, or brthday candles -- or divide a plain free-standing candle into seven sections by carving grooves in it or, as is most commonly done, by sticking pins into the sides and burning it a section at a time intil each pin drops. Your desire to perform a seven knob candle spell of ATTRACTION at the Full Moon is uncommon. J82 tried to set you straight by mentioning the waxing Moon. That is traditional. Generally, to draw or attract someone, you work in the days that lead up to the Full Moon, so that as the crescent of the Moon increases or waxes, the love attraction INCREASES and GROWS. After the Full Moon, as the disk decreases or wanes, you work to REMOVE or DIMINISH influences (such as disease or poverty or bad relationships. Finally, getting back to the actual topic of this thread, Catnip is a wonderful herb for attraction, and can be used in baths, to roll candles in, as a tea to drink (or added to prepared teas), and even as a subtle addition to pre-mixed Italian Spices when making Tomato sauce with menstrual blood. Aha, you are right -- and so am i -- because it is a 21 day spell! Fourteen days for waning and then seven days for waxing, so it ends on the waxing moon. I got confused with all the talk of a seven knob candle, thinking it was a seven day spell, thus run through a waning moon only. 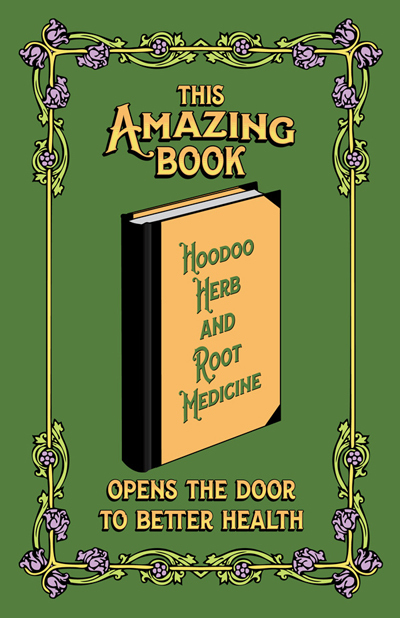 The medical qualities of this product are described in this book, with traditional folkloric remedies for home-herbalists to try. your math is right. If i start Aug 26th ends Sep 15th on waxing. Should I light candle too 7 day each, While i sprinkle liquid? I bought a whisky bottle week ago mix with catnip and let it sit to soak. Three seven-knob candles or candles marked into seven sections -- or 21 small candles. This is new situation, He doesn't want i pay damage off the car, I used it to keep contact with him. He was so nice to me said I forgive you. Then I told him I gave a statement to the police saying i will pay for the damage of his car. Then I told him If you don't want me to pay, the police officer advised me get a letter from you. Then he texted me said will draft a letter on Monday. So i can make him come to my house. I can ask print it and drop it. But he would drop it in the mail box. So i am thinking do something while he come here. What are the suggestions? When he is over use it as an opportunity to try and collect personal concerns of his, spit maybe on a napkin, hair etc. Also its a good time to give him a drink with your period blood in it. If you dont have any on had you can take a spiritual bath with the catnip water, wash your private parts extra well. Use a cup of it to make some type of food (before he comes), use some of the water in a beverage for him. Dress your body with the oil and make sure its on your hands when you hug him hello. seems your honey work is ding well considering how mad he was a few weeks ago. Dont get angry or jealous again. Good luck tomorrow! He might doesn't want see me. He would drop it in my mail box. All the time he says i am voodoo lol. When he see me he can't stop him. But i don't want invite him in as he might wonder why i am inviting him as i know him with someone else. Just want to go slow. Any other suggestions with out seen him. Any sprinkles, make him walk over, ect. You can sprinkle where he will walk put it right under the mailbox. Also dress the mailbox that he will touch with his hands. Can I sprinkle catnip bath water at my front area of the house where he walk? This product qualifies to be included in the Lucky Mojo 6 Herb Tea Special. 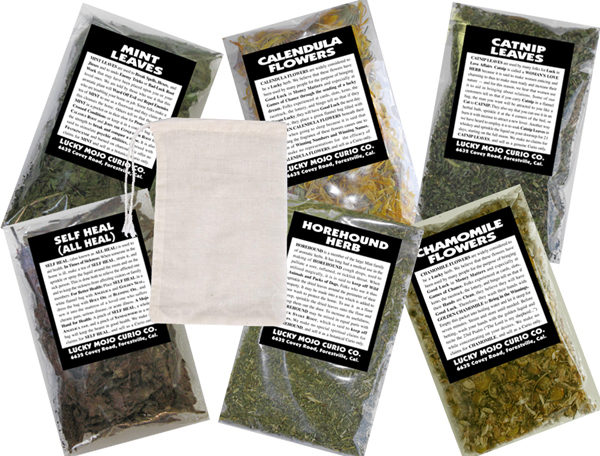 Buy six herbs for use as teas and receive a free small muslin tea steeping bag. To qualify for this special you must select six of the $3.50 HER (SKU code) items listed in this section. Botanical and Mineral Curios do not qualify for this special. Hi, Update about my situation. The letter thing didn't work. But we talk by texting. He was nice and good to me. I found part time job. on call. So I could not sprinkle catnip doorstep and light the candle. They called 6 am. Is it fine to do it evening? I am going to his apartment area to go see my mom. last night I was walking by his building i saw his balcony light on and inside light on too. usually when he is by himself he is not staying at balcony. i am sure that woman there too. Can't tell how i felt at that time. I am trying to hold my emotion. I trying o keep contact, but its so hard. i don't want to show him needy and i am trying to get back. i want to go slow and make him confident That we can make this relationship work. I realized when he text, he is emotionally suffering. He texted me said break up emotionally difficult. Sometime I feel talk to him direct, but I am scared, don't want push him away. I am so suffering. Yes you can sprinkle Catnip at night when he is not around but the sunrise was so the sun would rise on your relationship. You can also work with the hands on the clock so do it when the hands are moving upward to draw. Acting out with jealousy will be the silver bullet to the work, its done. Do not overreact, get mad, act out. He may be with another but that is temporary. You can use a reconciliation spell kit which has you write a heart felt letter to the person and dress it, this is a great way of being honest and using hoodoo at the same time. I am not jealous, its hurts. To be jealous, She is a very very unattractive hard biker woman with tattoos, colorful hair, piercings, hanging on rough biker bars, big drinker and big woman. Sorry, I am not insulting her. I am opposite. I am happy he could not find a woman better than me. But i m sad, last 6 years treated him like a god as our culture treating husbands like a god. He always telling to everyone i treated him like a king. Its make me so sad how could he can do this to me. Update. Last night I went to his apartment building to sprinkle catnip bath water. I added catnip bath water my menstrual blood mix it. I went inside while someone go in. I went to the parking to check is he out for his bike ride. But surprise, His bike was there. He did not go to his group ride. But i took the advantage, went upstairs to his door and sprinkle bath water door step, door knob, and floor. I heard he cough while i apply water on the door knob its make a sound i had to leave fast. I though he might hear the sound of door knob. However sprinkle at the main door and sprinkle while i walk home but only half of way water ran out. But i found something! Last few times he went bike ride with group, he took this woman too. But wondering why he did not go to bike ride. He is the president of that group. Other thing is , he is on holiday Sep 1st to 9th. He might going somewhere. I text him to give a cheque but he shout down. I did not bother to text him, i don't want to make him mad and push him. I will keep update. How often i sprinkle catnip bath water at his place? That really is a personal choice of work question. You can do it over a period of days, do it over 7 days, do it once. Do it during the wax moon to draw him. Sprinkle from his place to your door to signify drawing him to your door. Thank you, I did sprinkle from his place to my place but one the way it finished. I used a water bottle. Its 25 mins to walk from his to my place. I will try again. You can do it when you drive as well. Or select major roads and sprinkle at those crossroads leading to your steps. You want the last bit to fall on your steps. The spiritual culinary qualities of this product are described in this book, with edible magical spell-recipes you can prepare and serve to achieve you desires.